There is much to do at Fallängetorp farm. The farm’s activities changes with the seasons. Here we describe the various activities and some sights and activities within 30 minutes. At Fallängetorp you get an insight into what life at an organic farm is and the activities changes with the seasons. In spring you can, among other things cuddle with the newborn lambs and you have the opportunity to try out what it’s like being a farmer for a day or more. 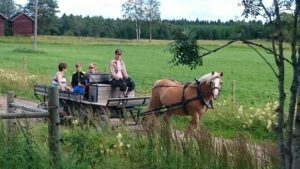 Here you can visit the animals in their stables / paddocks, rid a horse, travel by horse-drawn or tractor-pulled carriage, follow out in the forest with a guide to look for birds, hike along a nature trail with picnic basket and why not pick berries and mushrooms in the summer and fall season. 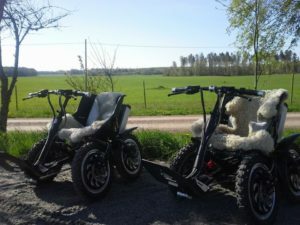 You can us the bike or Zoom and with a picnic basket explore the countryside. And when it´s winter ski across along the fields or bring your skates to one of the nearby lakes. 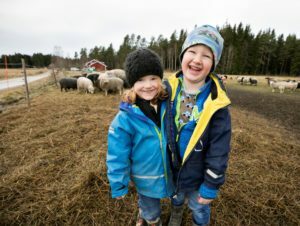 At Fallängetorp farm is plenty to do for all ages. Let your imagination lead you. Below you can read about our activities on the farm. For activities and attractions in the area, click here. Join us in our daily work, meet animals and experience nature in a peaceful and quiet environment. As a farmer for a day, you get a glimpse of life on a farm and you will join in the daily work with the animals. You can participate as much as you want depending on your ability and willingness. We take care of all the animals together; sheep, cows, pigs, horses, hens, cats and dogs, feed them and care lovingly for them. The activity takes around 3 hours including coffee and sandwiches. Join us in our daily work, meet animals and experience nature in a peaceful and quiet environment. As a farmer for a day, you get a glimpse of life on a farm and you will join the daily work with the animals. You can participate as much as you want depending on your ability and willingness. We take care of all the animals together; sheep, cows, pigs, horses, hens, cats and dogs, feed them and give them love. When you are a farmer for a weekend you can choose “All-in Farmer”, that includes all the meals for the weekend, as you will be eating together with us on the farm. If the weather is nice we will have a picnic and cook the dinner outside. It is also possible to choose self-catering. The price includes accommodation, sheets and towels, food for your stay here, breakfast, lunch, supper and coffee. We use organic and local products to the greatest extent possible. Children under 3 eat for free and sleep for free in a baby cot, an extra bed costs 250SEK/night. We need to be notified in advance of any allergies or other special dietary needs. 3395 SEK/adult and 2245 SEK/child (3-12 years). The price includes accommodation, sheets and towels. Children under 3 years sleep for free in a baby cot, an extra bed costs 250 SEK/night. 2400 SEK/adult and 1650 SEK/child (3-12 years). We offer a 1½ – 2-hour ride with horse and carriage. An exciting, beautiful and easy way to get out into nature. We drive past the animal pastures, our old farm ruin Kina and along winding streams and country lanes. (slingrande bäckar och grusvägar.) The carriage can accommodate 10 people or two wheelchairs / strollers and 4 people. Price: 250 SEK/adult and 125 SEK/children, with a minimum of at least 4 people or 1000 SEK. 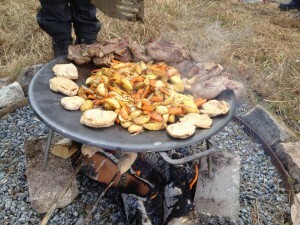 An activity in the wilderness, where commonality, joy and good food are in focus! Together we prepare a two-course dinner made of organic raw ingredients from the farm, local food producers and the nature around us. The point of departure of the activity is the courtyard where we tell you history of the farm and then we travel by horse-drawn or tractor-pulled carriage to the farm ruins of Kina, where gather around the fire and prepare the dinner together. In the firelight, we enjoy our dinner, coffee made over the fire, and the evening’s stillness – if we are lucky even the presence of wildlife. We call it “zooming”, a fun and different way to get around in nature without disturbing the animals and nature. An exciting and challenging experience for everybody and a wonderful feeling of freedom for those of you with reduced mobility. The Zoom Uphill is an electrically powered terrain vehicle that give you so much fun that you just can´t stop smiling. After the introduction, we´re going into the wild. We adapt the tour to your wishes, your ability and the current season. The tour takes around 1,5 hours and can be booked for a maximum of 4 people. Fallängetorp is located in the scenic Black River Valley. Here there are both marked hiking and biking trails and nice walking paths. 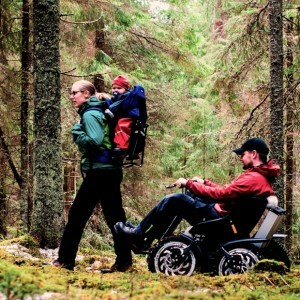 There are both long and short trips and for those who have a disability or difficult to go out in nature, we can offer you to use a Zoom Uphill. Do you want to have a picnic basket with you on the way, we´ll be happy to help you.